A protein found in cells throughout the body must be present in a specific set of neurons in the brain to prevent weight gain after chronic feeding on high-calorie meals, new findings from UT Southwestern Medical Center researchers suggest. Nicknamed the “longevity” protein because of its apparent role in mediating the effects of dietary restriction on life span, SIRT1 has been studied as a potential target for anti-aging drugs. Prior research also has shown that this metabolic sensor protein in peripheral tissues plays an important role in regulating metabolism, but its physiological relevance in brain neurons remained unclear. 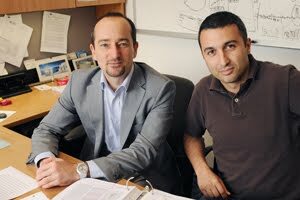 “This is the first study to show that SIRT1 in hypothalamic neurons, specifically POMC neurons, is required for preventing diet-induced obesity and maintaining normal body weight,” said Dr. Roberto Coppari, assistant professor of internal medicine at UT Southwestern and senior author of the mouse study, available online and in the July 7 issue of Cell Metabolism. POMC, or pro-opiomelanocortin, neurons are found in the hypothalamus region of the brain and are known to play an important role in suppressing appetite and inducing weight loss. There are about 3,000 POMC neurons in a mouse brain. The researchers genetically engineered mice to lack SIRT1 only in these specific hypothalamic neurons. They found that when fed a high-calorie diet, the mice lacking SIRT1 in POMC neurons gained more weight and were generally more susceptible to diet-induced obesity than those with the metabolic sensor protein intact. The mutant mice also had almost twice as much abdominal fat and more of the hormone leptin than those mice with their SIRT1 intact, despite the fact that all the mice maintained the same food intake and movement levels. “We found that SIRT1 must be present in POMC neurons in order for the hormone leptin to properly engage its receptors in these neurons. Without SIRT1, leptin sensing is altered and the animals gain more fat mass when fed a high-calorie diet,” Dr. Coppari said. In addition, the researchers found that SIRT1 must be present in POMC neurons for leptin to stimulate the remodeling of white adipose tissue into brown fat tissue, which “burns” fat to generate heat. White adipocytes primarily store fat. Dr. Coppari said the idea of a drug that selectively could target neurons controlling specific fat depots – and that could trigger the remodeling of white fat into brown fat – has high potential. “The drawback to harnessing adrenergic receptors to make more brown adipocytes, as a lot of people are thinking about doing, is that it puts a lot of pressure on the cardiovascular system,” he said. “However, the idea of having a drug that could selectively affect specific hypothalamic neurons that then control specific branches of the sympathetic nervous system suggests that one could avoid acting on unwanted cells but selectively on those able to burn calories such as brown adipocytes. “We could control the remodeling of a particular fat depot into brown, which would then be more likely to cause weight loss without increasing the risk of cardiovascular problems,” he said. The next step, Dr. Coppari said, is to determine whether SIRT1 is mediating other signaling pathways in the brain that in addition to regulating body weight are key for normal glucose balance.